And this was dessert for Easter dinner... usually I blog entire menus together like with my Valentines, Anniversary, Christmas and Burn's night posts. However, I wouldn't really recommend this for dessert after lasagna and garlic bread. It would all be a bit starchy and heavy, even we had a 4 hour break between dinner and dessert! That being said, this was delicious!! I will definitely be making it again. The recipe comes from Waitrose and is one of the few naturally vegan recipes there. 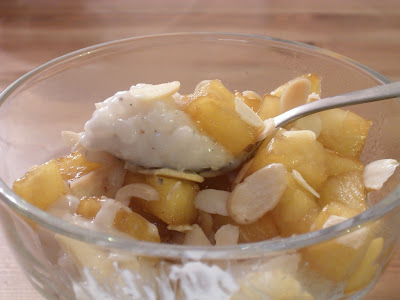 It uses coconut milk to replace regular milk, gently infused with cardamom and topped with sweet caramelized pineapple. Initially I was going to replace the cardamom with lime zest, simply as I love lime and of course it would go so nice with coconut and pineapple. However I am so glad I didn't as the cardamom added a really nice flavour to this, and it's not a spice I use that often. As much as I loved this I keep thinking the flavour possibilities are endless here, like using lime zest I was also thinking of making a 'Pina Colada Rice Pudding' by adding some rum to this as well. Loads of options here but even this basic recipe is gorgeous! Split the cardamom pods and remove the seeds discarding the pods. Crush the seeds into a coarse powder - I didn't have a mortal and pestle like called for but it worked fine with a blunt rounded object and bowl. Place the coconut milk and 200ml cold water in a pan with the cardamom powder and caster sugar. Heat gently until the sugar dissolves then bring to the boil. Reduce heat to a gentle simmer. Add the rice to another pan on medium heat. Add a ladle full of milk stirring constantly until absorbed, then add more making sure each addition is absorbed. Check rice after all the milk is added as mine was nowhere near done at this point. I heated up some more water and just kept adding more water until the rice was cooked. It took maybe half an hour instead of the 20 min they say. Don't worry about watering it down, it evaporates and tasted just fine. When that is nearly done toss the brown sugar with the pineapple and tip into a hot dry frying pan for 2-3 minutes so that the sugar begins to caramelize. 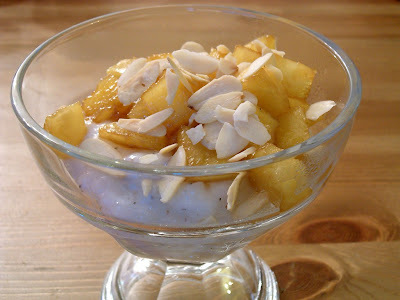 Spoon the rice pudding into bowls and top with the pineapple. I toasted some sliced almonds and sprinkled these on top too. Serve warm. Rice pudding brings back so many memories for me.